للگانی, اسماعیل, عبداله‌پور, سجاد. (1394). بررسی ادراک مدیران بانکی از کارکردهای بانکداری اسلامی (مطالعه موردی: بانک رفاه کارگران). فصل‌نامه مطالعات مالی و بانکداری اسلامی, 1(پاییز و زمستان), 141-164. اسماعیل للگانی; سجاد عبداله‌پور. "بررسی ادراک مدیران بانکی از کارکردهای بانکداری اسلامی (مطالعه موردی: بانک رفاه کارگران)". فصل‌نامه مطالعات مالی و بانکداری اسلامی, 1, پاییز و زمستان, 1394, 141-164. للگانی, اسماعیل, عبداله‌پور, سجاد. (1394). 'بررسی ادراک مدیران بانکی از کارکردهای بانکداری اسلامی (مطالعه موردی: بانک رفاه کارگران)', فصل‌نامه مطالعات مالی و بانکداری اسلامی, 1(پاییز و زمستان), pp. 141-164. للگانی, اسماعیل, عبداله‌پور, سجاد. بررسی ادراک مدیران بانکی از کارکردهای بانکداری اسلامی (مطالعه موردی: بانک رفاه کارگران). فصل‌نامه مطالعات مالی و بانکداری اسلامی, 1394; 1(پاییز و زمستان): 141-164. بانکدارى اسلامى بر مبناى وکالت و مشارکت در سود و زیان شکل گرفته و بیش­تر بر بخش­هاى حقیقى اقتصاد و سرمایه­ گذارى در این بخش­ ها تأکید دارد. بنابراین، برای توسعه­ ی این مفهوم در کشورمان، ابتدا لازم است که بدانیم چه درکی از این مفهوم توسط کارشناسان و مدیران بانکی وجود دارد. بدین­منظور، این مقاله میزان آشنایی مدیران و کارشناسان بانک رفاه را از کارکردهای بانکداری اسلامی مورد مطالعه قرار داده است. مطالعه حاضر یک پژوهش کاربردی و توصیفی- پیمایشی است و جامعه آماری آن 158 نفر از کارشناسان و مدیران ارشد و باتجربه بانک رفاه در استان تهران را شامل می­ شود. نتایج آزمون نشان داد که ادراک اعضای نمونه از تمامی کارکردهای بانکداری اسلامی، به جز به­کارگیری تکنیک­های بازاریابی، در سطح بالایی قرار دارد. همچنین براساس آزمون رتبه­ بندی فریدمن مشخص شد که از بین کارکردهای بانکداری اسلامی سوال 10 (حداکثر کردن منافع سهام­داران و استاندارد زندگی رفاه جامعه) بالاترین و سوال 7 (بکارگیری برنامه ­های بازاریابی متناسب با خدمات بانکداری اسلامی) کم اهمیت­ترین رتبه را دارا می­ باشد. Islamic banking has been formed on the basis of delegation and participation in the profits and losses and puts a great emphasis on the real economy and investment in these sectors. So, for the development of this concept in our country, we first need to know what understanding of this concept by experts and bank managers there exists. Therefore, in this article the amount of the bank's managers and experts of Islamic banking functions is studied. 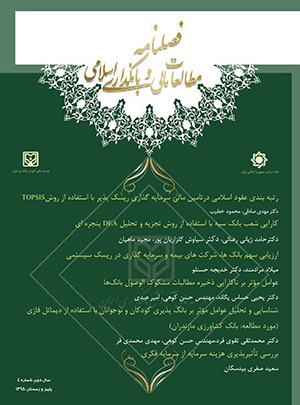 This study is an applied research and descriptive survey with a statistical population of 158 experts and experienced senior bank managers of Bank Refah in Tehran province. The results showed that the perceptions of samples of all Islamic banking functions except for the use of marketing techniques are at a high level. Also, based on Friedman ranking test it became clear that among the Islamic banking functions, Question 10 (maximizing the interests of shareholders and standard of living and welfare of society) has the highest and Question 7 (the application of appropriate marketing programs tailored to islamic banking services) has the least important rank. اکبریان،رضا و حمید رفیعی،1386: بانکداری اسلامی؛ چالش­های نظری- عملی و راه­کارها، فصلنامه علمی پژوهشی اقتصاد اسلامی، سال هفتم، شماره 26، صص: 97-118. اکبریان،رضا و مینو خردسو، 1389: تأثیر بانک­های اسلامی بر ثبات مالی در فرآیند جهانی شدن، مجله معرفت اقتصادی، سال اول، شماره 2. خاکی،غلامرضا،1378:روش تحقیق با رویکردی به پایان­نامه نویسی، کانون فرهنگی انتشارات داریت، تهران، چاپ دوم. داودی،پرویز و محمود عیسوی ،1389: بحران­های اقتصادی و راه­حل اقتصاد اسلامی، مجله اقتصاد، شماره 1. رسول­اف،جلال،1387: نوسازی نظام بانکی و توسعه بانکداری خصوصی، نوزدهمین همایش بانکداری اسلامی. صادق­ زاده،محمد،1391: شناخت شاخص­های ارزیابی بانکداری اسلامی، مجموعه مقالات همایش بانکداری اسلامی، انتشارات عترت نو، بانک رفاه. علمی،محمد،1388:پژوهشی در ریشه­های بحران مالی جهانی (2008-2009) و راه­کارهای مقابله با آن، شرکت چاپ و نشر بازرگانی، تهران. قضاوی،حسین،1388:تأثیر بحران­های مالی بر بانکداری اسلامی، مجموعه مقالات بیستمین همایش بانکداری اسلامی، تهران: مؤسسه عالی بانکداری ایران. محقق­نیا،محمدجواد و میثم احمدوند ،1391: طراحی سیستمی برای رتبه­بندی بانک­های اسلامی: با تکیه بر یک رویکرد تلفیقی، شاخص­های ارزیابی بانکداری اسلامی: مجموعه مقالات همایش بانکداری اسلامی، انتشارات عترت نو، بانک رفاه. موسویان،سیدعباس و میمنت ابراهیمی ،1392: شاخص­های ارزیابی بانکداری اسلامی،­ نخستینکنفرانس ملی توسعه مدیریت پولی و بانکی، مرکز همایش­های بین­المللی صدا و سیما، تهران. Abiah, F.K., Wabekwa, b. 2012. People’s Perception Towards Islamic Banking: A Field work study in Gombe Local Government Area. Nigeria, International Journal of Business, Humanities and Technology, Vol. 2, No. 7, PP. 121- 131. Abdullah, A.A., Sidek, R., Adnan, A.A. 2010. Perception of Non-Muslims Customers towards Islamic Banks in Malaysia. International Journal of Business and Social Science, Vol. 3 No. 11, PP. 151-163. Ahmad, K. 2000. Islamic finance and banking: the challenge and prospects, Review of Islamic Economics, Vol. 9, pp. 57-82. Ahmad, W. 2008. Islamic Banking in the UK: Opportunities and Challenges, M.Sc.Accounting and Finance Thesis submitted to Kingston Business School, Kingston University,London. Akbar, S., Ali Shah, S.Z., Kalmadi, SH. 2012. An investigation of user perceptions of Islamic banking practices in the United Kingdom, International Journal of Islamic and Middle Eastern Finance and Management, Vol. 5 No. 4, PP. 354-370. Albalawi, H.S. 2006. Banking System in Islamic Countries: Saudi Arabic and Egypt, Stanford University, Stanford, CA. Haron, Sudin & Yamirudeng, KuMajdi. 2004. Islamic banking in Thailand: Prospects and challenges, International Journal of Islamic Financial Services, Vol. 5, No.2. Bello, A. 2007. Interest-free Banking? Yes! Yaliam Press Ltd.
Chapra, M.U.1985.Towards a Just Monetary System, The Islamic Foundation, Leicester. Chapra, M.U. and Khan, T. 2000. Regulation and Supervision of Islamic Banks, Islamic Development Bank and Islamic Research and Training Institute, Jeddah. Haron, S., Ahmad, N. and Planisek, S.L. 1994. Bank patronage factors of Muslim and Non-Muslim customers, International Journal of Bank Marketing, Vol. 12 No. 1, pp. 32-40. Hajja, y. 2008. Evaluation of Islamic Banks' Performance in Malaysia: Foreign VS Domestic Banks, A Thesis Submitted to the Center of Graduate Studies in Partial Fulfillment of the Requirement for the Degree Master of Science (Banking), College of Business, University Utara Malaysia. Haque, A. 2010. Islamic banking in Malaysia: a study of attitudinal differences of Malaysian customers, European Journal of Economics, Finance and Administrative Sciences, Vol. 18, pp. 7-18. Khalidi, M.A., Amanaullah.2010.Consumer Perception of Islamic Banking in Pakistan, Labuan Bulletin of International Business & Finance, Vol. 8, PP. 1-21. Jalees, T., and Kamal, R. 2007. Brand Image of Islamic Banks. In Aneet and Singh R. (eds) Research in Management and Technology. New Delhi: Deep and Deep Publications. Ismail, A.H.2002. The Deferred Contracts of Exchange: Al-Quran in Contrast with the Islamic Economist’s Theory on Banking and Finance, Islamic Institute of Malaysia, Kuala Lumpur. Metawa, S.A. and Almossawi, M.1998.Banking behaviour of Islamic bank customers: perspectives and implications, International Journal of Bank Marketing, Vol. 16 No. 7, pp. 299-313. Obaidullah, M.2005.Islamic Financial Services, Islamic Economics Research Center, King Abdul Aziz University, Jeddah. Parashar, S.P., Venkatesh, J.2010.How Did Islamic Banks Do Dyring Global Financial Crisis. Banks and Bank Systems, Vol. 5, Issue 4. Rammal, H. G. and Zurbruegg, R.,2007.Awareness of Islamic Banking Products AmongMuslims: The Case of Australia,Journal of Financial Services Marketing 12(1), 65-74. Rosly, S.A. and Bakar, M.A.A.2003. Performance of Islamic and mainstream banks in Malaysia, International Journal of Social Economics, Vol. 30 No. 12, pp. 1249-65. Sarker, A. 2004. Concept and ideology, Issues and problems of Islamic banking, International Journal of Islamic Financial Services. Vol.1. No. 3. Siraj, K.K.,Pillai, P.S. 2012.Comparative Study on Performance of Islamic Banks and Conventional Banks in GCC region. Journal of Applied Finance & Banking, Vol.2, No.3, PP. 123-161. Woodley,S.2009.Growing Interest in Islamic Finance, The Diplomatic Courier: A GlobalAffairs Magazine, Washington, DC.